March 15, 2017:“We want to grow together with India, we want to be closer to you,” said Mr.Teofilo Terres Corzo,President of the Commission, San Luis Potosi, Mexico, at an interactive session at World Trade Centre Mumbai here today. 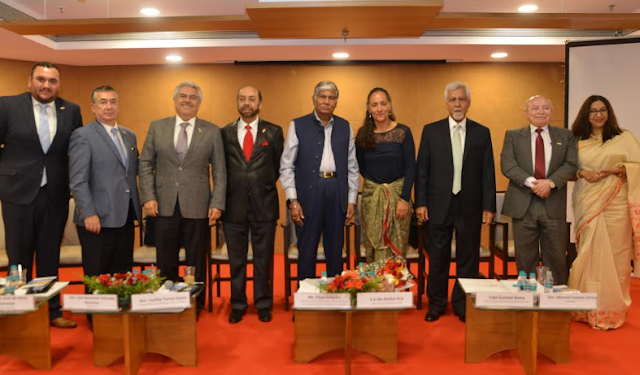 All India Association of Industries had organized the programme in partnership with World Trade Centre Mumbai and the ProMexico, Mexican Government’s trade and investment agency. Today,Mexico is India’s largest trade partner in Latin America.India is third largest buyer of Mexican oil.Mexico’s interests in India extends to pharmaceuticals, Information Technology services, entertainment and automotive products, said Ms. Melba Pria, Mexican Ambassador to India. A high-level delegation of Senators accompanied the Ambassador. The Senators are on a visit to India to explore furthering business and trade ties. The members of the delegation are: Senator Teofilo Torres Corzo of San Luis Potosi, Senator Jose de Jesus Santana of Aguascalientes, Senator Jose Ascencion Orihuela Barcenas of Michoacan, Senator Manuel Cavazo Lerma of Tamaulipas and Mr. Rodrigo Blanco of ProMexico. “Two great nations – one from Asia and the other from the American continent stand obliged to explore working together to expand the business ties and grow their respective economies”, said Senator Jose Ascencion Orihuela Barcenas. The liberalization of local industries and the abolition of monopolistic business practices open up new opportunities for Indian organizations to exploit. The critical avenues of agriculture, telecommunications and auto component manufacturing welcome Indian business to set up ventures in Mexico, Senator Jose added. “The structural reforms instituted by the Government of Mexico under the leadership of President Enrique Pena Nieto have helped economic growth in the last few years. Within a short span of four years, 14 structural reforms have been instituted. Transparency in governance reform has helped improve the ease of doing business in Mexico”, said Senator Manuel Cavazo Lerma. Newer markets are available and the continued drive to expand trade and business reforms makes Mexico especially well-suited to further the global ambitions of Indian companies. Corporate tax in Mexico is quite competitive and there is no state-level tax, added Senator Manuel Cavazo Lerma of Tamaulipas.Mexico produces more engineering graduates than many other countries of similar size.Indian companies looking to invest in Mexico have a readily available pool of talent to dip into, added the Ambassador. While welcoming the august gathering, Mr.Vijay Kalantri,President,All India Association of Industries said, “India’s trade with Mexico currently stand at about $7 billion, and has the potential to double over the next two years. Pharmaceuticals, agro-chemicals, Oil, Steel and Mining, IT and FMCG presents opportunities of bilateral trade between 2 countries and both countries should explore this potentially fully.”AIAI and WTC are also organizing a networking seminar on “India-Latin America & Caribbean Partnership: Opportunities to Promote Trade and Investment” later in early May in Mumbai to help bilateral trade between India and Latin America, he added. The vote of thanks was delivered by Capt.Somesh Batra. He noted that diversification is imperative for economic growth and pointed to the newly opened air connect between India and Spain, which holds the potential to connect to Latin America. He also noted that transparency in reforms go a long way in enabling economies to grow fast.